✓ For Scaffolding, Cable Trays and Ceiling Grids. 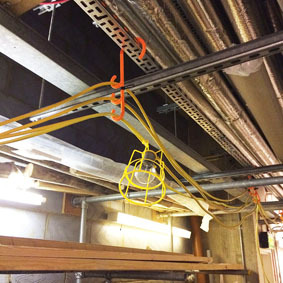 We designed these heavy duty S hooks to fit over scaffolding, cable trays and ceiling grids. They’re non-conductive, recyclable and can hold 5kg of weight. Each one has the capacity to hold 15 x 110 volt arctic cables. Most customers hang our s hooks from overhead features, but the screw hole in the side means they can also be fixed to walls. Once in place, the user twists the hanger away, puts in cables and allows it bend back into position. This secures the cables against the wall without damaging them. 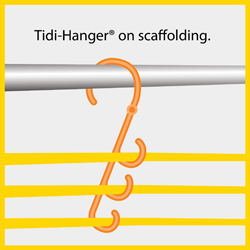 We stock Tidi-Hangers® in highly visible orange, with any colour available upon request. Why not make your site safer with S hooks in your company colours? Most of our customers who bought these were from construction sector, oil/gas production and film studios as there are plenty of overhead features to hang them from. All of our products are made in the UK from the best components and using them will ensure that you’re taking the reasonable steps to keep your site staff safe. 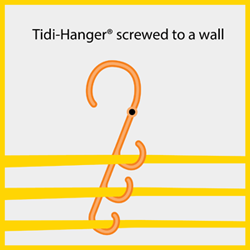 Tidi-Hangers® are stocked in retailers all over the UK and we ship globally, so get in touch to find out the best way to get hold of them. 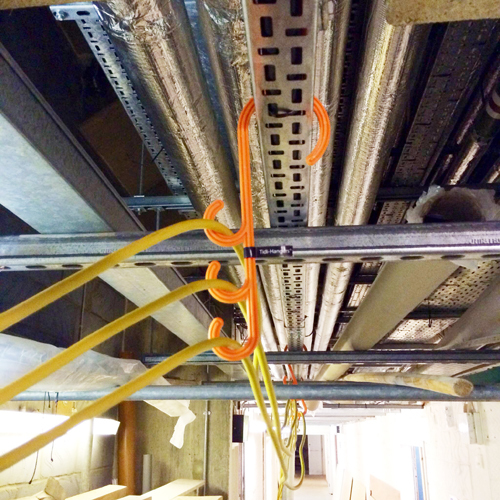 Here at Tidi-Cable, we really want to make your workplace safer by removing the danger of trailing cables. If you have an issue with cables, give us a call and we can discuss the best product to solve it.